public works: public works log: launch of 'the whitechapel gift shop' thursday, 27 Nov. The whitechapel gift shop is part of a larger project by public works which sees the transformation of an old pottery building in whitechapel e1 into a (non for profit) gallery and project space as well as the home for pilar and pele cortizo-burgess owners and shop keepers. 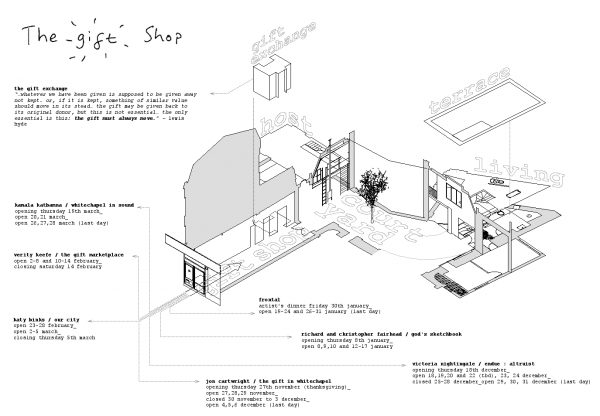 The premise is organised around a internal 'court yard' and comprises a living quarter that can accommodate previously agreed one off cultural events and the whitechapel gift shop, an informal cultural space engaging with the local community. 2)the gift exchange: where ‘gifts’ made by individuals or groups are exchanged for other ‘gifts’, not sold. 3)gifted: a series of workshops and conversations aimed at inspiring individuals and groups to discover and share their gifts. Building work to the living quarter will start early in 2009 once the first phase of residencies are completed. Both the development of the gift shop and the development of the design for the building works are running in parallel and indirectly inform each other. The project proposes an architectural process which is equally concerned with establishing a new network of social relationships as well as delivering a physical environment which can support those new relationships as they are being played out and expanded over time. Both aspects of the project explore notions of recycling and reusing which ultimately will inform the aesthetics of the build.